The Australian Magpie is a black and white bird found in all areas of Australia except in the arid almost treeless desert country. Totally adapted to the presence of humans and happily established in cities and towns Magpies are welcome visitors to residential backyards where their beautiful call makes a pleasing and melodic accompaniment to early morning risers. The Magpie is strongly defensive of its environment and in the breeding season is known to attack humans and pets that come to close to their breeding areas. This has never occurred to residents or pets at Cassa Creakingbones. 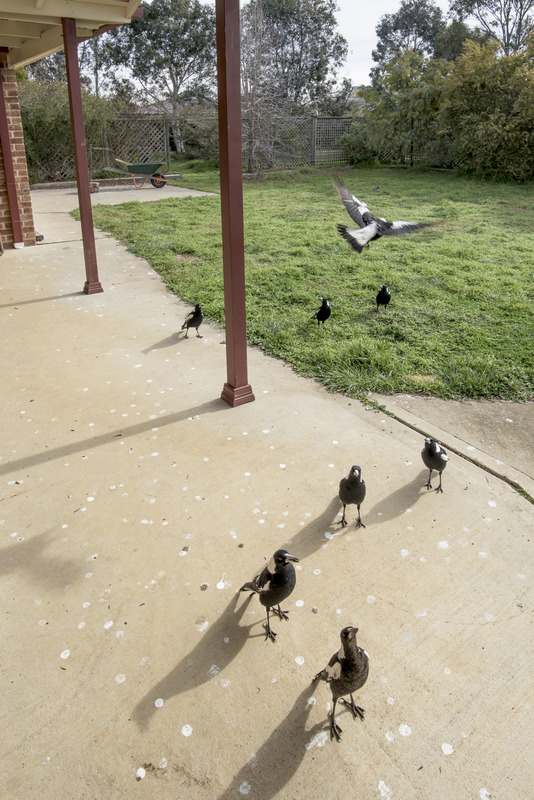 Magpie family groups can number up to 24 birds and once they adopt a backyard, if you have made the mistake of feeding them, they are almost impossible evict. That is exactly what has occurred at Casa Creakingbones. We took the decision about 15 years ago to feed about four Maggies that visited from time to time. It wasn’t long before we were hand feeding them with mince meat, toast and the occasional biscuit. That is when our visitors moved in permanently. Now, just after the breeding season in spring and early summer, their numbers in our backyard can number up to 30 or 40 resident individuals. We know that we should not feed them but it’s amusing to watch their antics, listen to their wonderful songs and from time to time, break up quite violent fights as the elders work to drive unwanted members of the clan to places new. Once a week it’s necessary to pressure wash our kitchen window sill and the area near the backdoor of their copious droppings. You see, the little devils, the moment they observe movement in our kitchen swoop down and land on the kitchen window sill and rap on the glass with their beaks to remind us that they are hungry. The glass gets grubby and the window sill, well, I leave it to your imagination. 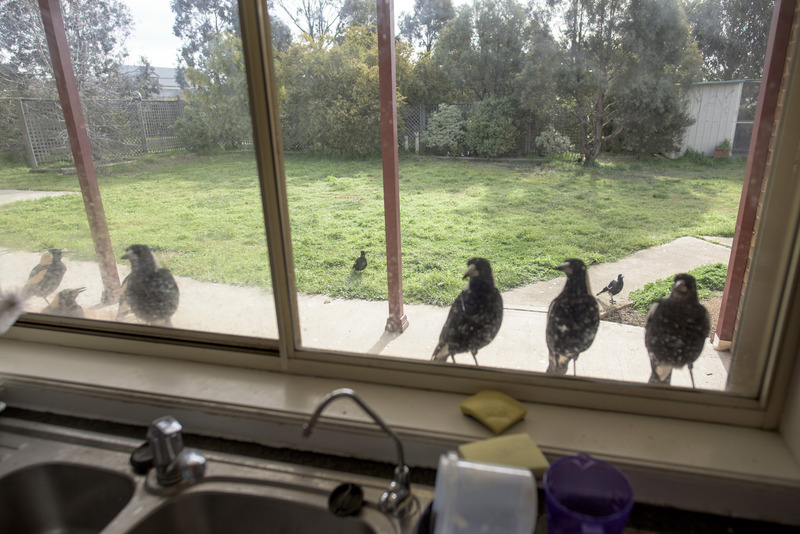 Today was no exception, as our lunch was being prepared, eight magpies arrived at the back door and four of their number settled on the window sill, waiting to be hand fed with beef mince and toast, their favourite. Now I should add that they are quite tame, our cat Ginger can wander around among them and cause no distress. Not only that, if we leave a door or window open, the four of them come immediately inside to feasts on the cat’s food. No, they are not house trained and after we have managed to convince them to leave, the carpet cleaner is put to good use. Today I decided to grab a few images of the lunch time occurrence and took a quick shot of the four on the windowsill and then around the back door and their carefree attitude to Ginger the cat. 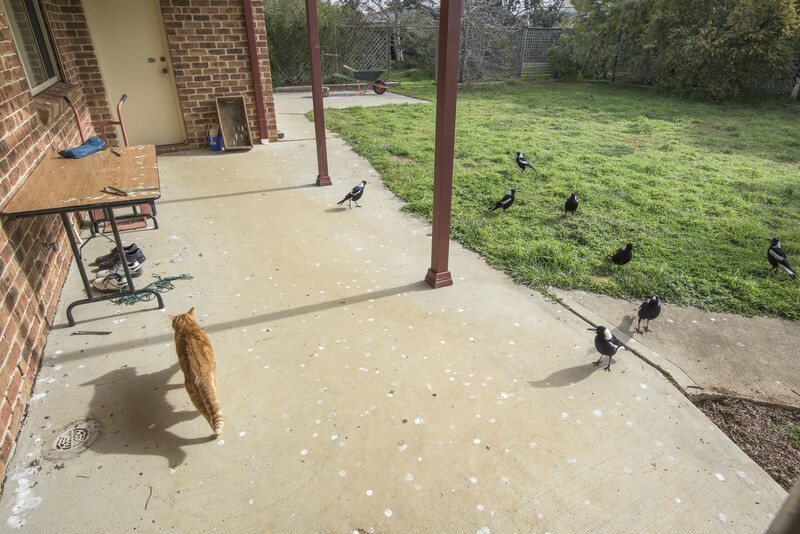 GINGER AND THE MAGPIES COEXIST PEACEFULLY. MAGPIES ON THE KITCHEN WINDOWSILL. Thanks, they are a lot of fun. I’ll try to photograph them when next they are inside having a snack. That is quite a few magpies! They eat like there was no tomorrow. I love maggies too but we dearn’t feed them all else we’ll have all the cockies here too! You are spot on, the Sulphur Crested, Galahs, Corellas, Peewees,Wattle Birds and the odd ducks from the river down the road all visit in mobs of various sizes and devour grey sunflower seeds by the 20kg bag full. Amazing how the Sulphur Crested love to prune the gum trees just to show how much they enjoy visiting. They love standing on one leg while shoving toast into their beaks with the other. Comical. Hahaha, i find them quite innocent. I would have enjoyed their activities too. Hope they don’t grow enough in numbers to become unmanageable! THE SCIENCE OF THIS SYSTEMATIZATION OF KNOWLEDGE IS KNOWN TO THE BIRD ANGEL? Love magpies. We have them in the American West (https://en.wikipedia.org/wiki/Black-billed_magpie), but not in the east. Here in the east we just have blackbirds, crows, and ravens. Cool birds.